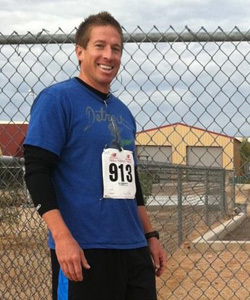 If you're looking for a personal trainer in Gilbert contact Jason Ingram, owner of our Gilbert ProFitness location. You don't have to be an athlete to benefit from the skills and expertise of a certified personal trainer. At our Gilbert location we train people of all ages, shapes and sizes. Our personalized programs are designed to meet your goals, and working within your limitations. You may be a runner trying to take your fitness to the next level, or you may have some unwanted pounds you need to lose, perhaps you need guidance on corrective exercises to identify and correct specific weaknesses. Maybe you're looking for a personal trainer to help you enjoy a healthy pregnancy or assist you with postpartum recovery? It doesn't matter why you want to get fit, the important thing is that by coming to this website you've recognized that you'll never get the same motivation training alone as you will with a personal trainer. Jason is an experienced, certified personal trainer; he has been training clients for more than nine years, but has been involved in fitness his entire life. An accomplished track athlete, Jason also competed in basketball, football, and baseball, always looking to stretch his physical and mental capabilities. This experience built his awareness of the benefits of teamwork, motivation, and competition. Lessons that he applies to the programs he designs for his personal training clients in Gilbert. Jason has extensive experience training runners and athletes, those seeking weight loss, corrective exercise (CES), and moms looking for a healthy pregnancy and postpartum recovery. Jason believes in making fitness as fun as possible, while getting results as quickly and safely as possible. His rationale - if it's not fun, you won't want to keep doing it! He designs progressive personal training programs that are customized to the individual, their capabilities and limitations. "To achieve outstanding results by expanding our clients' physical and mental capacity, while maintaining a motivating atmosphere. " If you're looking for a Gilbert personal trainer, contact Jason today at 480-272-5022, or by email at . Why not schedule a no obligation visit to our facility to meet Jason and explore your goals? Trainers! Are you a looking for a facility to work with your clients? We're always looking to hire committed, professional, fun-loving personal trainers in Gilbert who have their own clients. Let our Gilbert training facility become 'your' training facility. Contact Jason to discuss how the team at ProFitness can help you grow your business. Find out more on our For Trainers page. We pride ourselves on providing 100% dedicated service to every one of our clients. We inspire and lead each person to reach their fitness potential through a no-nonsense, no-fad, no-gimmick based path to health and fitness which guarantees success.